It was an awesome night at MTCS in Murfreesboro. 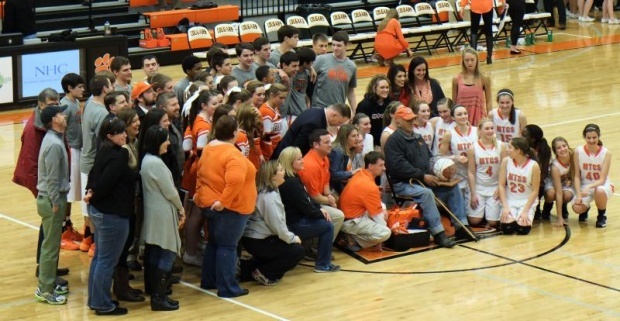 Both the high school boys team and the girls team won, beating out Santa Fe, but the heartfelt excitement was felt in between the two games when MTCS President Phil Ellenburg recognized a longtime supporter. Local resident Ernest Bogle celebrated his 30th year for attending Christian School basketball games on Tuesday night. Bogle attended his first game when he was invited to attend by the parent of one of the students at the school, Mrs. Freida Watson in 1984. Even though Bogle never had children who attended the school, he has stated many times that the children who play ball at MTCS are like his extended family. Mr. Bogle was presented a gift basket full of MTCS gear and an autographed basketball by past high school players who hit the courts at the school over the last 30-years. Players from every year surrounded Bogle when he was given the ball.